Fabiano is a two column blogger template with sidebar to its right and post section to left.The theme is designed by web2feel and converted by me to blogger.The design is minima style.Top menu page links are ready for you.Seo for title has been done and it supports all blog features and is compatible with all browsers.It has four column footer also for you to add more widgets , with search box also ready at top of header.Best part about the template design is the use of very beautiful images used for header and footer.Hope will like this template for sure. 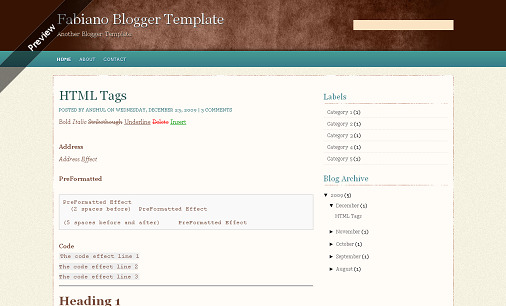 Other blogger templates you may like are provogue and pop-music. btw.. have u seo friendly blogger template simple, load fast, and elegant? Very good. i like the color combination.